Kief, naturally extracted with dry ice, is my favorite way to medicate foods. It’s easy to use dry ice kief by just stirring it into most any recipe. You can buy kief in a dispensary but you can also make it yourself. Don’t get intimidated. Dry ice kief is easy for anyone to make with just a few simple tools. The video below will show you, in under 2 minutes, how to do it! Detailed written instructions follow. You don’t actually need a full ounce of marijuana, you can use more or less as you see fit. You can even use trimmings although the quality will not be as good and you will need more plant material to get a comparable yield to kiefing flowers. Different cannabis strains will yield different results, but for a point of reference, in the batch we made on the video above we used 1 ounce of average quality buds in a 120 micron bubble bag. We shook with dry ice twice, for two minutes each time. In theory the first shaking will be of a higher quality. We find the difference to be minimal so we usually end up mixing it all together. When it was all said and done we ended up with 4.8 grams of raw kief. You will lose some weight in the decarboxylation process (see below). Our 4.8 grams turned into 4.5 grams to be used for cooking and/or smoking after it had been baked at 250 degrees F for 20 minutes. Bubble bags are so named because they are typically used to make bubble hash via a process of adding cannabis, regular ice cubes,(as opposed to dry ice) and water; and then filtering out the trichomes that are later pressed into hash. 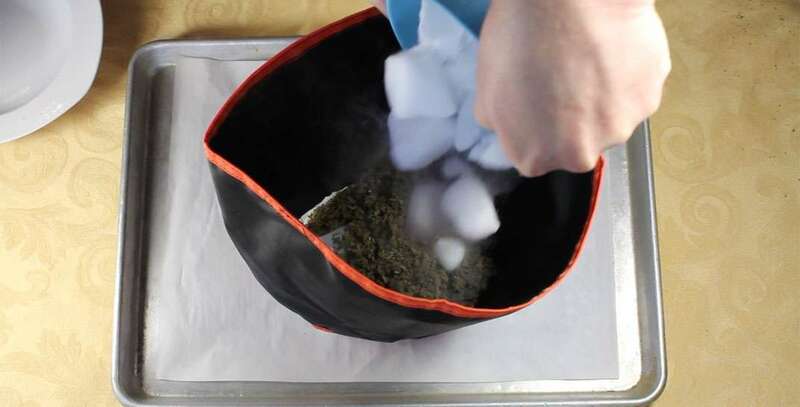 Bubble bags can also be used to make dry ice kief which is quicker, easier and far less messy. The bags are usually made of canvas and they have a fabric filter screen on the bottom. We used a 120 micron filter which will yield a decent quality of dry ice kief that’s perfect for cooking. To get a higher quality dry ice kief suitable for smoking, use a 90 micron bag, but know this will yield a slightly smaller volume. Click here to check out the Bubble Bag selection at Amazon.com. Let’s Make Dy Ice Kief! Before beginning, check out this link for more information about safely handling dry ice. Break up your dry ice piece into small chunks. To do this put a larger piece of dry ice in a plastic bag and tap with a hammer until it breaks into smaller pieces. Always wear gloves when handling dry ice. Crumble the marijuana with your fingers. 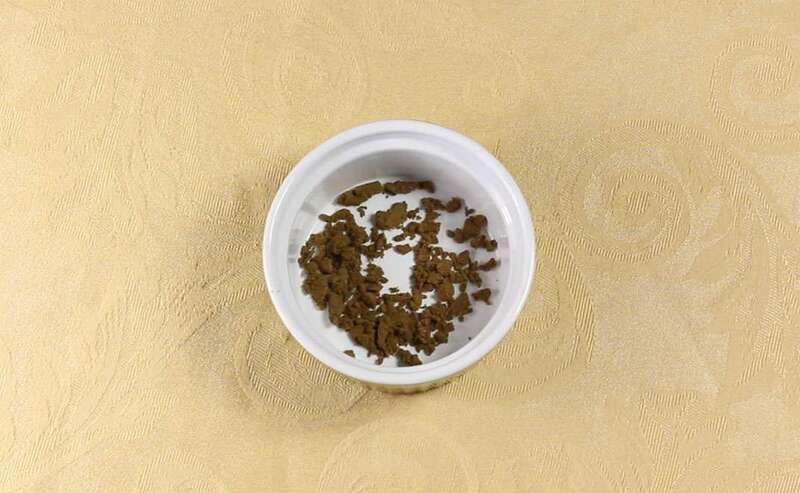 Do not use a grinder, all grinding will accomplish is to mix more plant material in with the concentrate, which is not what we are looking for. What we want to do is separate the resinous trichomes that are on the buds and leaves from the plant material. As these trichomes are ON the plant not IN it, there is no need for fine grinding. Just coarsely break up the plant material so it has more surfaces exposed. 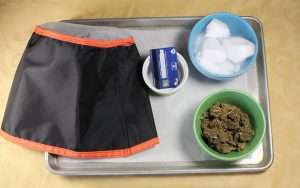 Place the crumbled marijuana in the bubble bag with some dry ice chunks. Shake the bag over a baking sheet that has been covered in parchment paper for two minutes. Scrape up the kief and shake for another 2 minutes. If you don’t plan on keeping the two batches separate you can just shake for 4 minutes total. Now that you’ve shaken, it’s time to bake – not metaphorically, literally! Use the credit card to scrape up the kief and put it into a ramekin or other small ovenproof dish. Before using in cooking you will want to decarboxylate the kief in order to activate the plant’s THC. Many people don’t realize that raw marijuana plants do not contain THC but only THC-A (or acid). 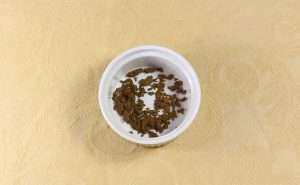 The process of baking the kief, or decarboxylation to use the scientific term, turns the THC-acid into psychoactive THC. Even if you plan on using the kief in a recipe that will be cooked, decarbing it first can up its potency. A friend lab tested a batch of brownies that had plain kief stirred into the batter, as opposed to kief that had been first decarboxylated, and found the latter to be about 30% more potent! 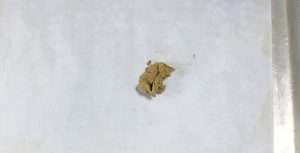 Decarboxylation is easy to do, just put your kief or hash in an oven proof dish and heat for about 20 minutes at 250 degrees F. Remove from oven, cool and you are ready to use for cooking. Click here for more information about cooking with kief, hash and other marijuana concentrates.